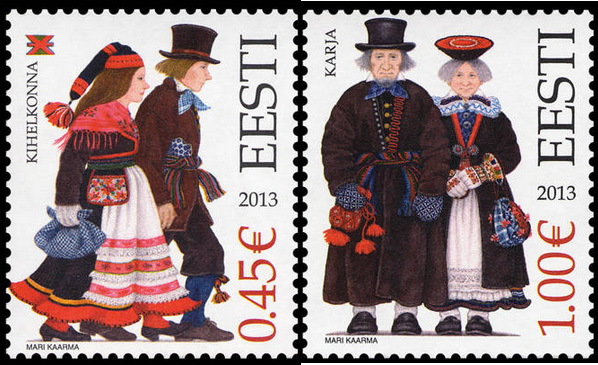 The stamps feature folk costumes from Kihelkonna in Western Saaremaa and from Karja in the North-eastern part of the island. 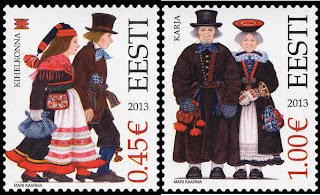 The Karja stamp shows an elderly couple in long coats, dress worn around the middle of the 19th century as well as later, with red strings and coloured edges adding zing to the dark fabric. The man’s long coat is edged with a wide striped belt in many colours. Mittens were a necessary part of the attire and when there was no need to put them on, they were stuck in the belt. Men and women throughout Saaremaa invariably wore checkered kerchiefs – men round the neck and women on the head. The man carries a tobacco pouch, while the woman’s pouch contains needles. The pouches were made of bits of coloured cloth. The woman wears one of the most peculiar Saaremaa headdresses – a round coloured cap, while the young married woman in the Maxicard wears a bonnet peculiar to the eastern part of the island. In Karja it could be either in geometric or floral design. Saaremaa bonnets all have a similar cut, but are still of a totally different appearance. The Kihelkonna woman featured in the postage stamp is shown in a tasselled bonnet general in Saaremaa, although it is different in the various parts of the island. A conspicuous feature, particularly for its shape, is the black crinkled skirt with a coloured lower rim. As for decorations there was a custom to wear several simple brooches one above the other. The First Day Cover shows how they were actually worn. The First Day postmark has a small motif from the Kihelkonna bonnet.